Paramania pilot and paramotor photographer / movie maker Glenn Tupper has set out an ambitious task to produce a world wide movie depicting exactly what is paramotoring to us all. 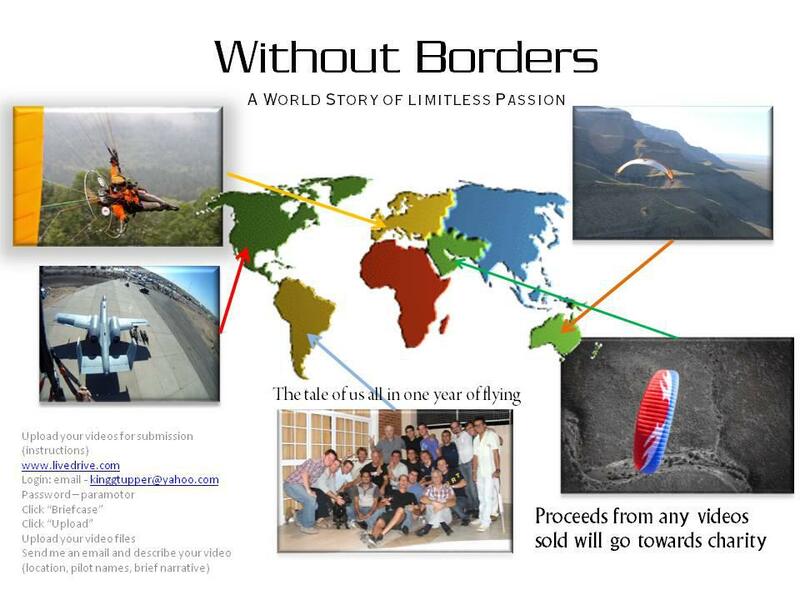 Launched on paramotor facebook group (http://www.facebook.com/groups/paramotor/) his project entitled ‘Without Borders’ is calling for your video footage from 2011. The aim is to edit all the footage into one continuous movie. This entry was posted in AIR, Air Videos, Events, New Products, Paramotor News and tagged borders, facebook, film, king tupper, movie, paramania, paramotor, ppg, without, without borders, world, world wide movie by Admin. Bookmark the permalink.